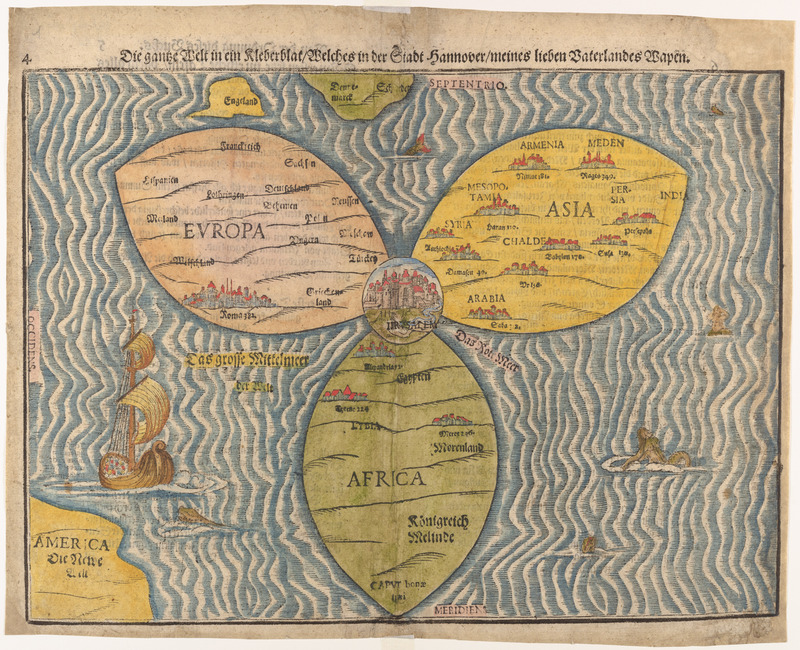 This map reflects important elements of religious T-O maps (see ID # 1003, T-O World Map from the Novissime Hystoriarum), including Jerusalem at the center of the world and emphasis on the three continents settled by the sons of Noah. On the other hand, it is oriented with North at the top, and acknowledges America, "The New World," at the edge of the old. Bunting, as a proud citizen of Hannover whose coat of arms contained the cloverleaf, used the symbolism to honor his "Dear Fatherland." See Shirley # 143; Nebenzahl # 32; Heijden 1998; Phaidon 2015, 18. See also Baynton-Williams 2015, 20: "The three-leaf clover also commonly represented the Holy Trinity, adding an additional layer of religious meaning to a devoutly Christinan depiction of the world." Date estimated; the Itinerarium was reprinted many times. Bünting, Heinrich, Itinerarium Sacrae Scripturae [Journey of Holy Scripture], first published 1581.